An actress' niece, an aspiring soldier and a heroic sheriff's sergeant were among those killed at the Borderline Bar and Grill. 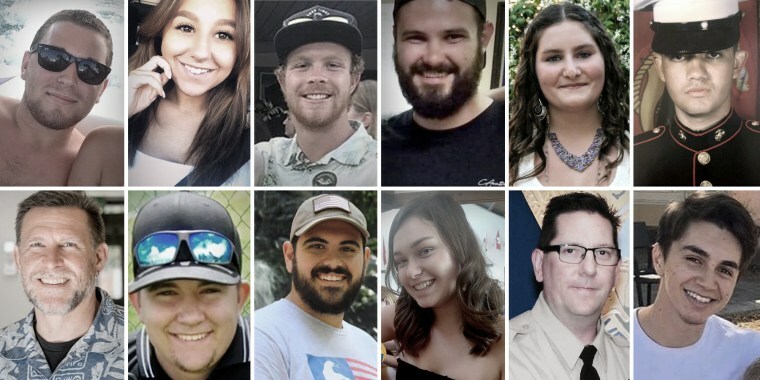 Victims of Wednesday night's mass shooting in Thousand Oaks, California. THOUSAND OAKS, Calif. — A father's desperate search for his son ended in crushing heartbreak in Thousand Oaks, where a dozen people were slain when a gunman opened fire late Wednesday inside a crowded dance hall. "I've been here fighting for him all morning long, and we did just get the news that he was one of the  that were killed last night," Jason Coffman, 41, told reporters Thursday as he choked back tears. "His name was Cody Coffman, my first-born son." "Only him and I know how much I love ... how much I miss, miss him," Coffman said, holding his fist to his heart as he struggled to speak. "Oh, son! I love you so much." The father's grief cut deep in this suburban Los Angeles community — recently named the third-safest city in America — where families now touched by gun violence were coping with irreplaceable loss. Cody Gifford-Coffman, 22, was a youth baseball umpire who'd planned to join the Army, according to his dad. Jason Coffman spoke with reporters outside of the Thousand Oaks Teen Center, where relatives searching for loved ones who were unaccounted for had been told to gather. Jason Coffman said he had last spoken to his son right before he left to go out with friends to the Borderline Bar and Grill — a Wednesday night ritual. Coffman told the Los Angeles Times that he had been awakened by his son's friends pounding on his door at about 1 a.m. telling him that there had been a shooting at the bar — and that they couldn't find Cody, who'd gone to buy his friends a round of drinks. Telemachus Orfanos, 27, was a survivor of the shooting last year in Las Vegas, where a gunman killed 58 at the Route 91 Harvest festival. He had also been a Navy SEAL, said his father, Marc. "He was a survivor of Las Vegas and how ironic, right," Marc Orfanos said. "And [he] was a bit of a gun enthusiast. ... You know who I hold responsible for this — the gun culture, OK."
Justin Meek, 23, an alumnus of California Lutheran University, was killed, as well. The university said he "heroically saved lives in the incident." "Everything he did was really brave," said Meek's friend Lala Lyman, who wasn't at the bar. "It was heroic. We lost someone truly great." "From what I understand, Sean tried to disarm" the shooter, Adler said. "That is typical of Sean. He was a protector, always sticking up for people. He was a caring, compassionate individual. I just don't understand. I don't understand the world." "I gotta go. I love you, I'll call you later," his boss, Sheriff Geoff Dean, quoted him as saying. Sheriff's Sgt. Eric Buschow said Helus "had every intention of going in there and ending that threat and saving lives." "Unfortunately, he was just met immediately with gunfire," Buschow said. "It's a tragic loss for all of us, for the community." Another victim was Alaina Housley, 18, a student at Pepperdine University and the niece of the actress Tamera Mowry-Housley. The university said she was from Napa, California, and was a freshman majoring in English. Mowry-Housley and her husband, former Fox News correspondent Adam Housley, spent the night trying to find out what had happened to Alaina. Adam Housley, who went to Los Robles Medical Center at 3:30 in the morning to look for her, told the Times that he feared the worst because her Apple Watch and her iPhone showed that her location was still at the bar. Housley later issued a statement on behalf of Alaina's parents, which said, in part: "Words can't describe our grief over losing our daughter, Alaina. She was everything we could hope for in a child: kind, smart, beautiful and respectful." Madeleine Carr, a junior majoring in journalism who once interviewed Housley, said she quickly became a prominent member of the college community. "She's only been here since August, and she'd already found her way into choir and mock trial and all these different facets of the community," Carr said. "Usually, you see people just getting involved in one — not all. And she seemed to have found her way into a lot of people's hearts." Another of the slain, Daniel Manrique, was a former Marine. "My brother was a veteran who wanted to help fellow recovering veterans in re-entering society and gave his all to supporting veteran mental health," his brother Marcos Manrique wrote on Instagram, according to NBC Los Angeles. "He ran in to help people escape the violence and ultimately gave his life protecting others. Describing the pain would not do it justice. I'll be remembering a hero, a brother, and a role model." Manrique, 33, was the Pacific regional program manager for Team Red, White & Blue, a nonprofit veterans service organization, whose executive director, John Pinter, said in a statement: "Dan's life was dedicated to serving others, during his military career and beyond." Blake Dingman, 21, lived in the Newbury Park area of Thousand Oaks and had played baseball at Hillcrest Christian School, the Pasadena Star-News reported. "We were really proud of him," a great-aunt, Janet Dingman, told the newspaper. "He was a really fun, energetic and loving nephew." Noel Sparks, 21, was a student at nearby Moorpark College, the Press Enterprise newspaper of Riverside reported. Her death was confirmed by her church, United Methodist Westlake Village. Rev. Dr. Walter Dilg told the paper she'd sung in their choir when she she was younger. "Having her reared at our church, there are a lot of people who are terribly heartbroken over this," he said. Kristina Morisette, 20, was a waitress at Borderline, and had just returned from a trip to Austin, Texas, her parents told the San Diego Union-Tribune. Her father, Michael Morisette, told the paper he'd been worried about her flying, and she convinced him she'd be safe. The parents remembered her as kind-hearted and talkative. Jake Dunham, 21, was an avid off-roader and good friends with fellow victim Blake Dingman, the Los Angeles Times reported. His father Ken Dunham told NBC Los Angeles before his son's death was confirmed he was a regular at Borderline, especially on College Night. He said he'd called his son repeatedly after finding out about the shooting. "It just keeps ringing out. And he always answers his phone," Dunham said. Mark Meza Jr., 20, a Santa Barbara native who was an alum of the Carpinteria Unified School District, was among the fallen, the district said in a statement to NBC affiliate KSBY. Meza's family said he'd been working as a busboy and food runner at Borderline. Santa Barbara City College said he attended the school, and that the “the entire SBCC community mourns this tragic loss of bright, young, promising lives." "We are heartbroken to learn of Mark's death," SBCC spokesperson Luz Reyes-Martin said. Meza's family said they were "devastated." "Marky was a loving and wonderful young man who was full of life and ambition," they said in a statement to KEYT. "Marky would have turned 21 on November 19." The Ventura County Medical Examiner's Office confirmed the names and ages of all the victims on Friday afternoon. James Rainey reported from Thousand Oaks, and Dareh Gregorian reported from New York. Alex Johnson and Ali Gostanian contributed.